In the mid 60s I worked for Sinclair Refining Company. My title was warehouseman. There was an old grouchy man named Henry that was the truck driver. Daily he made deliveries to service stations who ordered Sinclair oil, transmission fluid, lubrications and sings you would buy at a Sinclair Service Station that was a Sinclair product with their name on it. Henry was very quiet and very organized. He rarely said anything except what needed to be said in order of his work. That is, he was very quiet until you upset his routine…. If a dealer had to have something that day, and Henry just came in for the day and you told him he would have to go back out and make one more deliver. Then he hit the roof and fuss and carry on and refuse – then went ahead and take it. After a couple of times, I learn to just go ahead and let him rant and rave – when he got it out of his system he would make the delivery. I forgot the occasion. But for some reason when Henry was on vacation something from the office had to be delivered to him, I forgot what it was. I volunteered to take it to him. That evening after work Anna and I drove to his house. I think his house was east of Atlanta in or near Decatur. It was an older white-frame house subdivision. Each house had add-ons – remodeled and altered. The neighborhood suited him. He seemed grateful and touched that we went out of way to bring whatever it was to him. His wife was a nice little lady that was very congenial. I bet she heard a lot about me – she probably also knew to let Henry rand and rave to get it out of his system. They showed us the house. Which I don’t remember anything but the back porch. The back porch one time was screened in but they converted it to a green house. Henry was a pepper grower expert. I knew he had a pepper with his sandwich everyday but wow! The whole backporch-greenhouse were many species of peppers growing… red, green, yellow, and shape. You name it. He showed me a section on a table and said asked me have I ever seen these. They were called Peter Peppers. They were little peppers about the size of your finger that were all shaped like circumcised penises. What a conversational piece! He gave us a few to carry home. I didn’t feel right eating them, so they eventually went bad. The other day I thought about Henry and his Peter Peppers and haven’t heard of that kind of peppers before. 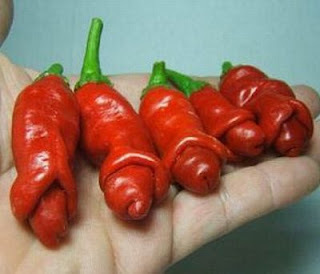 So, for the heck of it I googled “Peter Peppers” and found them to be more common than I thought. 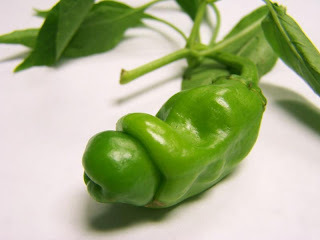 I should have pickled my Peter Pepper. And your dirty pictures are neat. Does Lorena Bobbitt fit into this anywhere? No, but if Lorane had known about Peter Peppers and took her anger on those instead, well, there would be no news story that week. 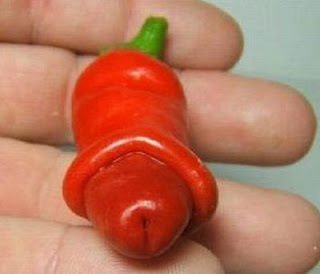 THAT is the funniest pepper I have ever seen!! Goes to show what a perverted mind I have ... at first glance! 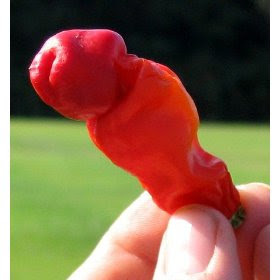 And now I'm feeling guilty, because the story behind the "hot peter peppers" turned out to be so innocent! Well, I don't want to mention what I think when I see two cantaloupes side by side. The Big Bang is Today!